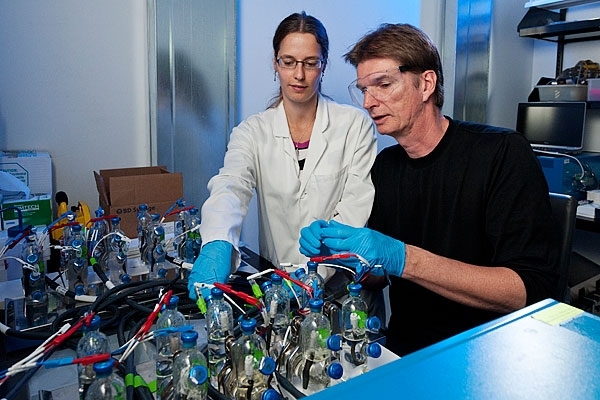 Post-doctoral fellow Svenja Lohner, left, and Professor Alfred Spormann. Their research, along with the work of others, could help solve one of the biggest challenges for large-scale renewable energy: What to do with surplus electricity generated by photovoltaic power stations and wind farms. Researchers at both campuses are raising colonies of microorganisms, called methanogens, which have the remarkable ability to turn electrical energy into pure methane – the key ingredient in natural gas. The scientists' goal is to create large microbial factories that will transform clean electricity from solar, wind or nuclear power into renewable methane fuel and other valuable chemical compounds for industry. Burning natural gas accelerates global warming by releasing carbon dioxide that's been trapped underground for millennia. The Stanford and Penn State team is taking a "greener" approach to methane production. Instead of drilling rigs and pumps, the scientists envision large bioreactors filled with methanogens – single-cell organisms that resemble bacteria but belong to a genetically distinct group of microbes called archaea.